Using the ActiveState AMI and Amazon EC2 infrastructure you can run a virtual private server with ActiveState’s language distributions and any additional software you want to install. The AMI is based on the latest release of Amazon Linux at the time the image is built. The language distributions are installed in /opt/$language-$version and environment variables are configured so that the languages and any associated binaries work in the shell without additional configuration. Open your web browser and navigate to aws.amazon.com/marketplace. Search for ActiveState and click the ActiveState AMI link in the results. Select the region to use from the For Region drop-down list. 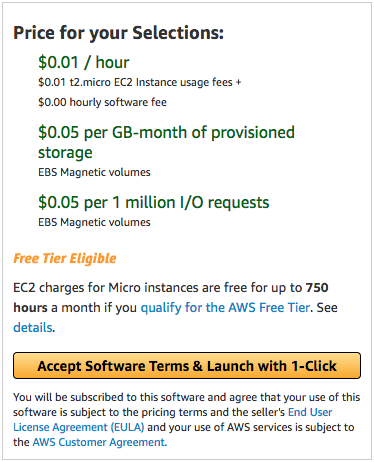 Review the Software Pricing and Infrastructure Pricing, and the available EC2 Instance Types. Sign in with your existing AWS account, or create a new account and then sign in. Version: Select the ActiveState AMI version to use. The latest version includes the most recent releases of the included ActiveState language distributions. Region: Select the Amazon data center location closest to you. EC2 Instance Type: The ActiveState AMI supports a variety of EC2 instance types, which differ in CPU architecture and speed, RAM, disk sizes and types, and network bandwidth. Ensure you choose the right instance type for your needs. Choose the t2.micro instance type if you want to take advantage of the AWS free tier, which is available for 12 months when you sign up as a new user. For details, see aws.amazon.com/free. VPC Settings: Verify or configure your Virtual Private Cloud settings. For more information on available configuration options, see the Amazon Virtual Private Cloud Documentation. Security Group: Configure one or more security groups to control access to your AMI instance. A security group acts as virtual firewall to control connections to and from the instance. The default security group allows connections from all IP addresses. Key Pair: You need select the key pair, or generate a new key pair, to use when you connect to your instance. If you need to create a new key pair, click the link to navigate to the EC2 Management Console, create a new key pair, and then refresh the Launch on EC2 page. Click the Accept Software Terms & Launch with 1-Click button to create your ActiveState AMI image. Navigate to the Amazon EC2 Console. Select the instance to connect to and click Connect. A dialog box is displayed listing the steps to connect, and an example of the command line syntax, which is specific to your instance. Note: Instructions for accessing your ActiveState AMI are also included in the email from the AWS Marketplace confirming your subscription.